The Intern is an easy, breezy office space confection that makes for a lighthearted viewing, feels Sukanya Verma. 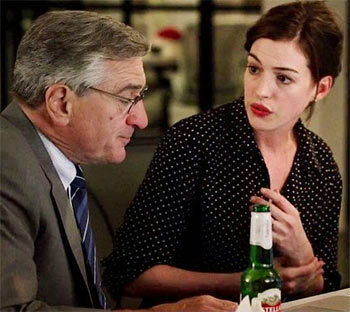 As I sat down to write about Nancy Meyers' The Intern, I thought how if I treat the movie like one and write its review like a Q & A, an interview. I dare say, I am old-fashioned, not really big on plot and rely terribly on the chemistry my leading actors generate to look good. Like my tagline suggests -- experience never gets old -- I am trying to make a valid point about the value of hard-earned wisdom that only comes with age. It all unfolds when Ben Whittaker (Robert De Niro), an astute, composed 70-year old retired gentleman comes to work for his industrious, perfectionist boss Jules Ostin (Anne Hathaway) at an online clothing store in Brooklyn. Business is booming but like most successful entrepreneurs Jules struggles to spend quality time with her family while resisting the likelihood and humiliation of veteran supervision. Ben is just what she needs -- a modern-day fairy godmother only this Cinderella hosts her own ball, designs her own costume and chariot, all she needs is a little reassurance that nothing will change into rags or pumpkin after midnight. Share your strengths with us. Oh, the leading actors, hands down! I wouldn't be the same in the absence of De Niro's calibre and Hathaway's finesse. Their chemistry is effortless, as are their interactions, pitch-perfect in tone, never overstepping the line yet conveying warmth that's nuanced and transcends the screen. They built a lot more than what's on paper, it is a joy to watch them work together in every sense. It's to their credit that even the stereotypical interactions around an affable, amusing set of co-workers hit all the right notes. I am also pretty easy on the eyes. Keeping in the Nancy Meyers tradition of tasteful interiors, I continue to look straight out of a Pottery Barn catalogue. Can we expect an equally honest answer on your weaknesses? Like I said earlier, I am not so concerned with conflicts as with the ideals of adult relationships that aren't remotely romantic or sexual in nature. But I'm so caught up exploring the workings of startup business in detail that I completely neglect to flesh out Jules' family and the budding affection between Ben and his office masseur, played most elegantly by Rene Russo. I'll admit, there are times when I come across as lazy and lackluster. Although the idea is to project novelty through Jules' progressive, stay-at-home, too-good-to-be-true husband, his dedicated rearing of their young daughter, it emerges as the weakest link. Maybe the tame casting is at fault; I really don't have a good excuse. There's a feeble attempt to mention the difficulties and judgment a working mother has to cope with from society that either deems her inefficient or overtly ambitious for being a strong-minded individual. But he contrived solutions it offers dilutes the impact of its intent. Guess I got so preoccupied in appearing wise and avoiding melodrama, I didn't realise I'm not getting anywhere. I am only glad I figured my mistake before it was too late. What are your goals with this internship? To showcase the day-to-day challenges of startups, the need for a support system, the desire for guidance, the beauty of friendships outside one's age group but most importantly, stress the point that a woman CAN have it all. There's a conscious attempt to evoke sympathy for people engaged in e-commerce and customer care. An easy, breezy office space confection that doesn't require much of your time or intense emotions, I exude a distinct charm, one that's rarely seen in pop-culture obsessed material today. It's as how Ben describes his handkerchief ritual, "one of the last vestiges of the chivalrous gent."